Before you roll your eyes at my scathing self-indulgence, this is not a blog post about a haircut. Well it is, but it’s more than that. It was supposed to be just be a post about a haircut, but I wrote this on Sunday night, after a glass of wine and I was a bit rusty when it comes to writing, so before I knew it I found myself down an odd rabbit hole of identity crisis / fresh starts / a blog make-over and a haircut, all rolled in to one not-so concise ramble. I’d grab a cuppa if I were you. Part of it is probably a little bit of an identity crisis. Well, less of a crisis, more of a hiccup. I’m still stuck in the post-baby ‘I don’t know who I am anymore’ funk. Harrison is nearly two, so I’m not sure I can call it a ‘post-baby’ funk, but I’ve never quite found myself again after becoming mum. It all sounds a bit woe me, but I’ve finally found my feet in motherhood and I’m completely content with that part of my life, but the rest of it is a shambles. At the moment I’m holding on to the safety net that is my 9-5 job, it was supposed to a nice and easy filler job for a year or two before I got back on track with my career, but having hit that year mark, I’m not really sure what that my career is anymore. Originally, the career plan was in the police, but I thought taking a hiatus to get used to motherhood was the best idea. 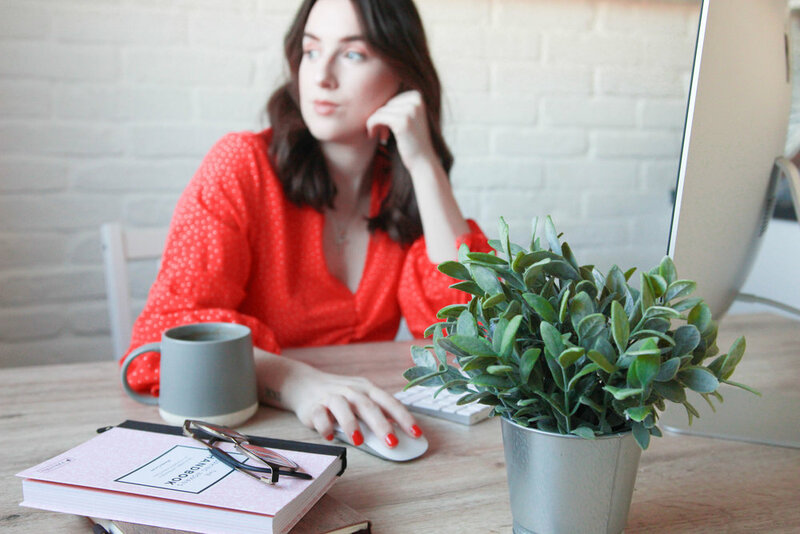 I took on my filler job after maternity leave, and I started blogging a bit more seriously, and two years later I’m starting to wonder if this should be my new plan. It’s not a conventional career sure, but maybe it’s the one I’m supposed to have right now. Or maybe not. Maybe it’s the glass of wine speaking, but I feel like I’ve finally accepted that I just don’t know exactly what I’m doing. And I don’t have to. Going in circles is not a bad thing. It’s still a direction (albeit a weaving one). Going with the theme of fresh starts, if you are a long time reader of Life with Boys you may have noticed a little bit of a shake up with how it’s looking right now, and when I say shake up, I mean I got rid of the eye sores and made everything a little bit simpler. I’ve had what may be the fifth redesign in the last year, but I think I’ve finally found a set up that I’m happy with. I felt like thought the blog needed a little bit of an uplift to go with it. Or at least, that’s how I’m justifying it. The reality was that it was a form of procrastination while I couldn’t think of a damn thing to write about and couldn’t figure out why. It’s very difficult to write about your life when you feel as though it is all over the place. Rather than mindlessly fumble through for any longer, I pulled my socks up and decided to really sit down and work out what I was doing with Life With Boys. Life hack: if you are self employed and ever want a kick up the arse to sort your life out, do your tax return. When you realise just how much tax you owe it's hard not to want to rejig everything. I have a concrete business plan in place now. (Well, less concrete and more plasticine but I have a starting point.) Creative ruts can be a pain in the arse, but I feel like I finally have a little bit of clarity as to what I am doing. I feel like a new person. New hair, new plan, new mind-set. This post has gotten out of hand. It’s been a long way saying that I’m out of my funk. I don’t know what I’m doing with my life but I don’t have to. I’ve updated Life With Boys, came up with a tangible business plan and I got a hair cut. So here’s to fresh starts.